Sustainable and Organic practiced restaurants are popping up all over Pittsburgh and Stout Pub and Kitchen strives on these practices while delivering a relaxed, fun atmosphere. Where did Stout come from? Stout Pub and Kitchen is one of the new concepts from the owners of The Yard. Currently, in Pittsburgh, The Yard currently has five locations including one next door to Stout Pub and Kitchen. Stout prides itself on bringing local farm goods into the restaurant. Farms like Jubilee Hilltop Ranch and Jamison Farms, with cheese from Middlefield, and pierogies from Bubba's in Greensburg. All meats are cured and smoked in-house. Stout also has a rotating menu that evolves all of the time. 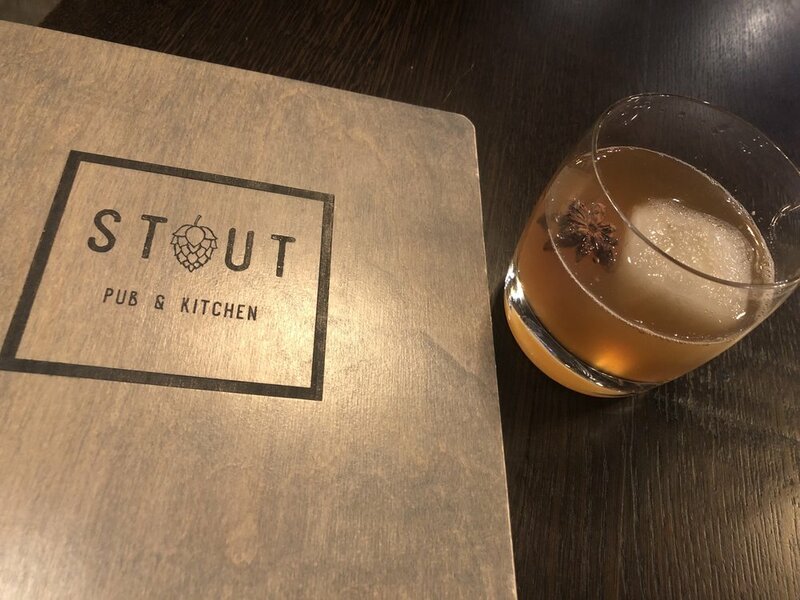 Along with a great menu, the cocktails and beer list are extensive at Stout. The taps are rotating, however, the cocktail menu is divided up by serving. For example, there is a list of cocktails just for dessert. Most cocktails contain a local spirit like Wigle and Liberty Pole. The food at Stout Pub and Kitchen is sustainable and prepared organically and most of it comes from local farms. For an appetizer, I ordered the Pork Belly Bites since the meat was still curing for the Charcuterie Board. The Pork Belly Bites were crispy and tasty. They came as a handful in a bowl drizzled in a blueberry and blackberry sauce. For a second appetizer, I ordered off of the Pierogi menu. They have traditional pierogies as well as outrageously fun pierogies. I tried the Buffalo Chicken Pierogies. They were the traditional Pierogies stuffed with buffalo chicken (spicy sauce included) and drizzled in ranch dressing. For the main entree I ordered a Stout Burger. This delicious burger is made from locally sourced Dry-Aged Jubilee Beef, topped with house-smoked cheddar, Roma tomato, pickled onions, pickle chips, bacon and greens served on a brioche bun. All of the handhelds served at Stout Pub and Kitchen are accompanied by French Fries and a pickle spear. Desserts are on daily rotation. On this day I ordered Apple Pierogies. Tasting like Apple Turnovers, these amazing desserts are fried pierogies filled with warm cinnamon apples and then topped with vanilla ice cream. Stout Pub and Kitchen is located at 690 Chalet Dr. Pittsburgh, PA 15275. Reservation for Stout can be made on Open Table or by calling (412) 249-8675. For more information visit https://stoutpubpgh.com. Want to see some of our other favorite restaurants? Visit our piece on Coughlin’s Law for a pic of an amazing smoked burger. Also, visit our piece on V&V Scratch Kitchen for smoked wings!